Watching sailboats dance on the water moving quickly with the wind is scene repeated daily in Northern Michigan during the warm weather months. Sailing is a special pastime that often brings friends together in Northern Michigan. And no wonder. The sailing here is wonderful. The NM Sloop--for Northern Michigan Sloop--first hit the waters of Little Traverse Bay in 1934. This classic, open cockpit daily sailor still has a strong presence in Northern Michigan with NM racing taking placing throughout the summer months hosted by the Little Traverse Yacht Club (LTYC). LTYC is one of the nation's older yacht clubs and began in 1895. LTYC is all about sailing and supports not only NM racing but several other fleets including J/70s and Alerions. Tuesday nights on Little Traverse Bay is race night and you'll typically see two courses with boats trying to out sail each other. At the end of July is a rite of summer in the Northland: Little Traverse Yacht Club's Ugotta Regatta. Celebrating 50+ years of sailboat racing, the Ugotta Regatta hosted by the Little Traverse Yacht Club (LTYC) takes place year on the weekend following the 2nd Mackinac race. In 2016, the Regatta will take place July 29-31. During Regatta weekend, spectators line the waterfront from Harbor Springs to Bay Harbor to watch the sailboats race across Little Traverse Bay. Youth sailing is important in Northern Michigan. 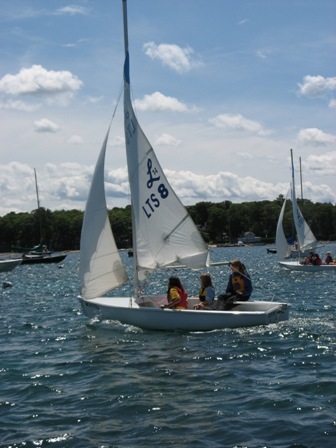 Youth sailing "schools" in Charlevoix, Boyne City, Bay View, Crooked Lake, and Harbor Springs offer instruction to children. Little Traverse Sailors (LTS) in Harbor Springs is located on the waterfront at the Little Traverse Yacht Club and the young sailors maneuvering sailboats in the harbor is a summer sight that never fails to mesmerize the watchers. On Crooked Lake, the Crooked Lake Sailors offers a five-week sailing program with one-week sailing sessions beginning in early July.